Some 15 members and guests braved a rather grey April afternoon for a walking tour of Dorchester led by one of our Trustees, Professor Malcolm Airs, a leading architectural historian who lives in Dorchester and used to be the local Conservation Officer. The afternoon was a real treat. 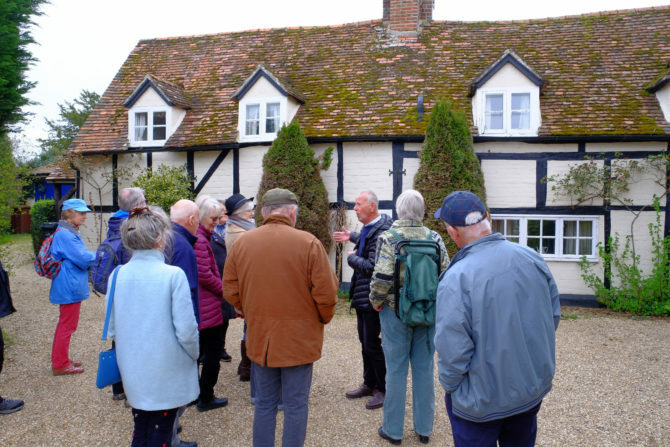 Malcolm gave us an overview of local history from before Roman times to the present: Dorchester had twice been a cathedral town (until the first See moved to Winchester and then the second to Lincoln), and we now have a village with a distinguished collection of listed buildings. We learned to look at houses with a new eye and notice how the front elevations (often just the front) had been updated over the years: half-timbered houses having being rendered and then, in some cases, later uncovered; or brick fronts with new windows had been added (we saw a particularly fine Georgian example and learned about the decorative use of beautiful locally fired bricks). The internal layout can typically be deduced from the position of the chimneys, the number of fireplaces being proudly displayed to all by the design of the chimney stacks (until the introduction of chimney tax!). We saw different building materials ranging from cob (a dried mixture of clay, gravel and straw) and chalk blocks to timber frame and brick, we learned to detect alterations revealed through uneven roof lines, and we saw how over the years the height of the buildings had been raised bringing dormer windows into front elevations. We shall now look on these buildings with a new understanding of their development. Many thanks to Malcolm.